Massive front page news on the Dompost today, that the Watermark project has stalled / stopped / been reborn as a new project. All in the one day. Someone has been busy. So, the carparks (presumably those below ground) have been removed – no great surprise there – in that part of the city, next to the sea, that must have been one of the more unsustainable parts of the project. The apartments are also to be simplified, office floors inserted in somewhere (in place of some of the apartments? ), and a ’boutique hotel’ removed. While the article notes that part above the Chambers Building has been scrapped, the few images of the development show little built above the Chambers anyway (the pointy bit that remains on site after the earlier demolition), so presumably not a great saving there. The Duxton will no doubt be relishing the chance to stick their Resource Consent oar in again, and possibly get the whole case re-examined once more. While this has to be one of the more un-shocking items of news in recent times, being rather obvious to all who live and work in Wellington that the massive signs proclaiming “We’re bucking the trend” and “A life above the ordinary” were all massively – how shall we put it – “over-optimistic“, there’s still an element of schadenfreude in this announcement. 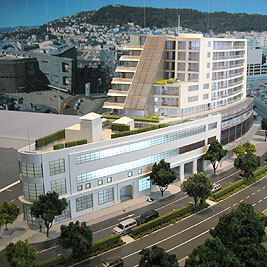 Was Wellington really keen on such blatant displays of wealth as was being promoted here? At the Fish, we’re keen to see what your views are on this ‘news’. I’m very sad over this news. I was hoping that they would get all the appropriate funding to carry on with their original plans. It was one of the few apartment buildings in Wellington I really felt was doing it right. They had the look, they had the fit out, and they had the location. Still I hope they can get this underway fast so at least something useful can be made of the site and that as much of the original feel and look will be retained. I hope the Duxton gets over themselves and lets them be. It will be interesting to see if Donald has to reapply for a Resource Consent. My thinking would be yes. I can’t believe that a project that went through a notified resource consent, and two environment court hearings would be ticked off by the council, just because it’s getting smaller. Life (or teh RMA) doesn’t work that way. StudPac have obviously been very busy…..
Well, I was no great fan of the original as it lacked an outstanding concept for the exterior and always looked dis-proportionate. The look was last century without an answer in combining the old building with a new one. a swept up angled glazed wall wasn’t really an answer. But I felt the interior had a bit more to it although there was a clash of art deco and 60’s pop – (recessed oval ceiling features). The project will need a new resource consent as a s127 amendment doesn’t allow too much leeway. Removing parking and changing the shape of the exterior aren’t covered as a minor in the RMA. Not quite sure why this would be such a prime apartment site. Close to the sea, certainly, but also a traffic island: multiple lanes on all sides. Pretty effectively cut off, pedestrian-wise, from the CBD even though it isn’t far away. For the same reasons, not sure how well it would work for retail. Happy to be proved wrong though. As architecture: disproportionate is right. Just plain awkward. The Duxton is one of my lease favourite buildings in Wellington. I think before they’re allowed to object to anything, they should be forced to do something about their bloody ugly building. davidp – re your Duxton comments – too right! Absolutely no schadenfreude on my part, I reckon it looked great. It’s a shame the orginal design isn’t going ahead (I mean the angled roof, not the carparks), but hopefully the revised version will look good. I think the project should be re-conceived as a prison to hold all the worldwide financial scammers who were responsible for the crash that led to the stalling of the project. Good to see a redcution in the rediculous amount of glass fascades that still feature in many NZ building developments. The obvious question for me, why not a full-blown green roof? Why stop at a few marginal hedges? Given the two-tiered roof, a SUDS on the lower roof would be nice too, taking run off from the higher sections of the building. . .